Thank you for updating your review. We are thrilled to hear that your concerns were addressed in a timely manner. For future questions or concerns, please don't hesitate to contact us at customersupport@empiretoday.com. 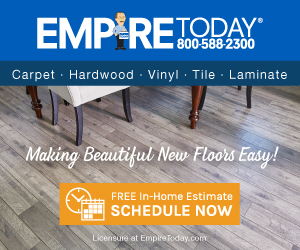 I was contacted asap by empire today and they setup a appointment to have the tile fixed. They came out and relaid over half the floor and fixed the problem. This is a very honest company. Great job! Had a new tile floor installed in my kitchen. Chose empire because the price was right. All went well until I noticed a few tiles not flat a level. Had to show the installer and he did cut out the old installed the new. But after he finished and left. I found many more. Recently I had to move my fridge and he hadn't let the mortar setup and just pushed it onto unset tile. Plus grout was cracked. Review #598582 is a subjective opinion of varner.p56. Hi Phillip, thank you for bringing this matter to our attention. We never want our customers to be disappointed with the work that is done in their homes, and we would like to know more about the issues you’ve been experiencing. We will be following up with you shortly, and you can also reach us at 888-588-2315 x4195 or customersupport@empiretoday.com.